Princeville is great for so many things. Just to name a few, its ideal central location, award-winning golf courses, tennis clubs and courts, resort living, beautiful scenic walks, and gorgeous Bali Hai mountain views. For most though, when thinking of all the fabulous amenities that Princeville has to offer, beaches don't typically top their list. Well, you may be surprised to discover that there are several hidden beach gems along Princeville's cliffside. 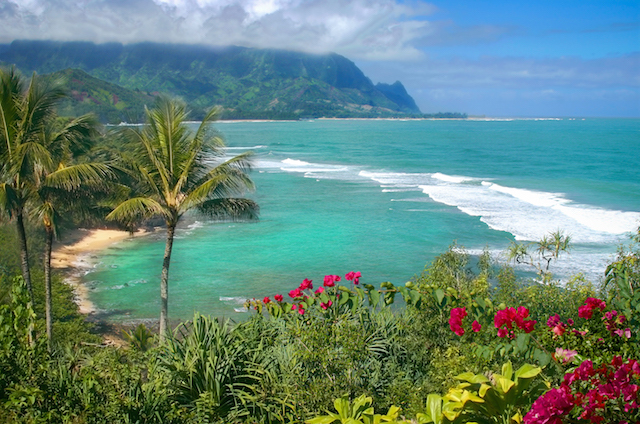 Hopefully the list provided below will bring you a new discovery of Kauai's north shore. Located below the St. Regis Hotel and Hanalei Bay Resort, this beach boasts incredible views of Hanalei Bay and Bali Hai. Because it is lined with a reef, this long narrow beach is great for snorkeling, with a few sandy pockets for swimming. Rentals of stand-up paddle boards and kayaks are also available for rent through the St. Regis pool staff. During extreme low tides in the summer months, you can even cross the river to Hanalei Pier. During the winter when the surf is big, this is a popular beach for surfers to paddle out at. The beach can be accessed along the public staircase that is to the left of the entrance of the hotel. As parking is difficult here, one could consider using the valet service to store your vehicle, although I would suggest being considerate of the hospitality and make sure to order something from the poolside cafe. If you are a guest of the St. Regis, you have access to their elevators as opposed to using the public staircase. Guests of HBR have access to the paved driveway that leads directly from the resort to the beach. Although these two are considered different beaches, because they are simply separated by a large rock outcropping that can be swam around during calm waters, I am listing them together. Hideaways is a crescent-shaped sandy shore with beautiful turquoise waters, frequent visiting turtles, and deep reefs for snorkeling. The best time to visit this beach is in the afternoon as in the morning the sun is still behind the ridge. This beach is more ideal in the summertime as the high surf can make the waters rough. We recommend packing light when visiting here...just a towel, sunscreen, water, and snorkel gear. If you are a strong swimmer and the waters are calm, you can swim around the rock cropping to the opposing beach, Pali Ke Kua. I have found this side to be a little less crowded but this may just be because it is a little bigger. This side of the beach is also accessible by foot down a paved trail between buildings 1 and 2 in the Pali Ke Kua Resort. The trail leading down to Hideaways is accessed behind the small public parking on the right hand side just before you pull into the St. Regis. The trail is steep and can be slippery when wet, therefore we suggest wearing proper footwear. Also, be mindful that there is no lifeguard on duty here. Sea Lodge offers plenty of sand and shade and is protected by an inner reef, which makes it ideal for snorkeling and not so great for swimming. This means that high tide is the best time to visit here, so be sure to check a tide chart. Due to limited parking, this beach remains pretty secluded, even sometimes deserted, which is always a plus in my book! The hike down is about 1/4 mile and can often be buggy, so make sure to lather up with repellent. To reach, head north into Princeville for about .7 miles. Turn right on Kamehameha Road and take all the way till it ends at the Sea Lodge parking lot. Make sure to park in a 'visitor' spot to avoid getting a ticket. The trailhead is between buildings B and C and is marked by a safety warning sign. Located in the Anini Beach Park area, Wyllie Beach is a small beach on the far west end. It is secluded and shady and the water is calm and clear (except, of course, when it is raining:) If the channel is not deep, you can easily cross and walk the stretch of Anini beach for 1.5 miles. This area is great during high surf since it is protected by a very large reef that prevents the surf from reaching the shoreline. To enter, park at the public access lot at the Westin Hotel, which is just outside the entrance to the resort. Access the trail by the edge of the golf course. Make sure to stop and enjoy the epic view from up top! If you would like to know more about Princeville beaches, or the community of Princeville, contact me.